My name is Maria A. Sabando, and I am a senior marine biology student at Florida International University (FIU). I have been working in the Southeast Environmental Research Center (SERC) stable isotope research lab at FIU for 3 years with lab manager John Harris. During my time at the lab, I have aided John in stable isotope analysis of carbon and nitrogen for labs both inside and outside FIU. This has given me the chance to work with tissue samples from a variety of organisms, including sharks, dolphins, alligators, whales, and birds, and both terrestrial and marine plants. 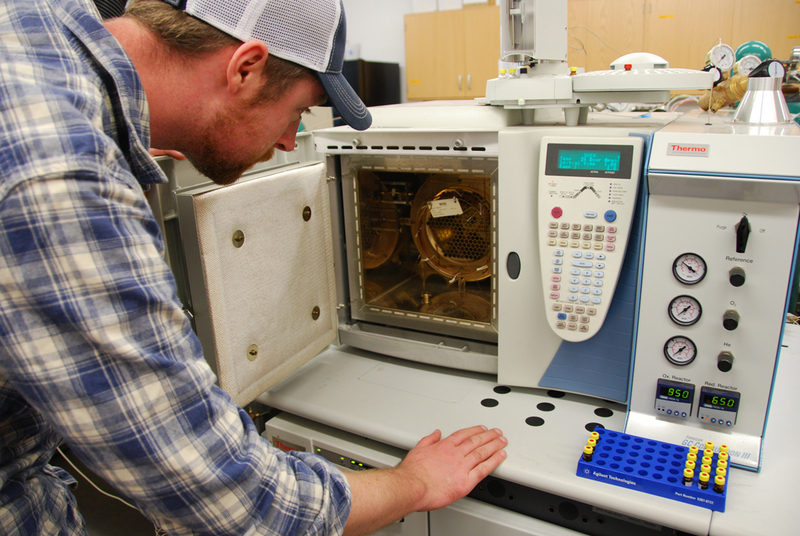 The SERC lab also offers a variety of other tools for analyses we can conduct, like coulometers for inorganic carbon analysis that I have worked on for projects with the Earth and Environment department at FIU. More recently, I begun to work with Dr. Robert Nowicki from Mote Marine Laboratory, Dr. Diana Churchill from Mt. San Antonio College, and graduate student Valeria Paz from the Marine Community Ecology lab at FIU to bring online a new kind of analysis for FIU- compound specific amino acid stable isotope analysis. This analysis will be performed on tissue from captive sharks and rays to get a better understanding of their diets. During this project, we are working towards a protocol for analysis that could lead to more accurate understanding of trophic levels (i.e., how high an animal sits in the food web) for these predators. 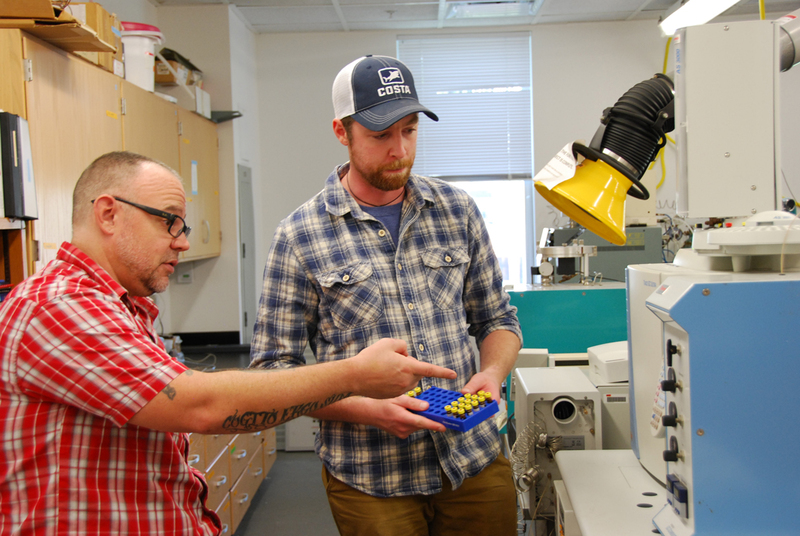 Over the past several months, John and I have worked on the Delta V plus isotope ratio mass spectrometer to find and fix several leaks and troubleshoot anything wrong with the machine. We began the process in February 2017 and only recently have gotten the Delta V to the point where it can be tested and samples can be processed- with machines as sensitive and complex as this, anything can go wrong, so even steps that seem simple on the outside can take a long time to get right. For example, through the process of bringing the machine online, we found 7 different leaks in the system that had developed over its idle period and replaced 4 valves (one of them twice)! During the troubleshoot time, we also worked on the protocol with Valeria for the chemical preparation techniques that need to be done to the samples before they can go in the machines. Before we use actual samples, we also needed to start with standards to ensure the preparation technique and Delta V machine are as accurate as possible. This was another task that came with its own complexities. For example, though the actual process of chemical preparation only takes around 6-7 minutes to do per sample, the chemicals used (pyridine, methylchloroformate, and chloroform) are so heavily regulated that they couldn’t even fly- instead, the $3,000 worth of chemicals had to be delivered by armored truck- a delivery which took 4 weeks! There is still a long way to go in terms of the project, but I could not have asked for a better project as my first to show me the ups and downs of the scientific process. I would like to thank Diana, Robert, and SOSF for allowing me to be a part of it and I look forward to continuing to work with all of them.